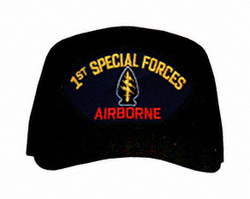 ArmyDecals is proud to offer this 1st Special Forces Airborne Custom Embroidered Military Cap. This cap is available in a 5 panel high profile or 6 panel low profile styling and are fully customizable. The Made in the USA caps are made of a wool/acrylic blend. The imported caps are made of cotton twill. All our caps are made from top quality materials. This cap would make a wonderful addition to your collection or a great gift! All our Military caps are fully guaranteed. All custom embroidery is done at our facility in Scottsboro, AL. As with all custom work provided on ArmyDecals.com apparel, returns are not accepted unless there are material defects in the products themselves.